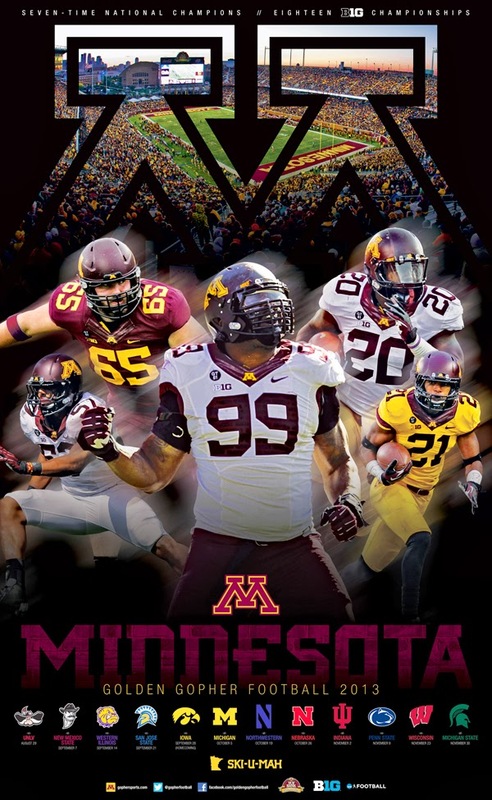 Minnesota produced seven posters, one for each home game. It's part of the Golden Gophers' "Brick by Brick" campaign highlighting coach Jerry Kill's philosophy, and the team backed it up with a dedicated website. 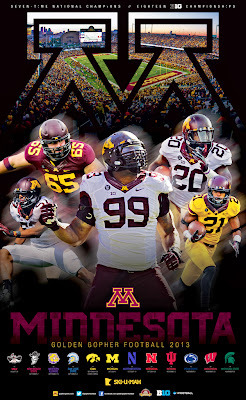 Minnesota plays host to Texas Christian on Sept. 3. Minnesota continues its marked improvement under Jerry Kill. The Golden Gophers, cleaning up the mess left by Tim Brewster, won only three games in 2011, which was Kill's first season as coach. But it went 6-7 in 2012 and 8-5 in 2013. It's going to be tough to get past eight wins in 2014. The November schedule is perhaps the toughest in the land, with games against Iowa, Ohio State, at Nebraska and at Wisconsin. Seldom if ever do you see a kicker get the boot, but that is what happened in Saturday's game between San Jose State and Minnesota at TCF Bank Stadium in Minneapolis. The Spartans' Harrison Waid attempts an onside kick late in the contest and, after the ball is recovered, is flattened by the Golden Gophers' Derrick Wells. Ward gets up and goes after Wells and a scrum ensues. The officiating crew huddles and decides to eject Waid. Minnesota is a program on the rise. Jerry Kill guided the Golden Gophers to the postseason in his second season and given the recent history of the program, that's quite a statement. Now the trick is to navigate through a challenging Big Ten schedule, get back to a bowl game and end a five-game postseason losing streak. Minnesota's last bowl win came in 2004, a 20-16 victory over Alabama in the Music City Bowl. There is an opportunity to start 5-0, but then a schedule of conference heavyweights — at Michigan and Northwestern, Nebraska at home — come calling. The Golden Gophers' fate will likely come down to the last four games — at Indiana, Penn State, Wisconsin and at Michigan State. Minnesota is off to its first 3-0 start since 2008, but the Golden Gophers appear to have lost quarterback MarQueis Gray for two to four weeks because of a left high-ankle sprain he suffered in Saturday's 28-23 victory against Western Michigan. Max Shortell replaced Gray in the second quarter and completed 10 of 17 passes for 188 yards and three touchdowns. He had one pass intercepted. Minnesota plays host to Syracuse on Saturday night.